SPORAH TV: AMAZING & HEART BREAKING TRUE LIFE STORY ON THE SPORAH SHOW THIS WEEK. AMAZING & HEART BREAKING TRUE LIFE STORY ON THE SPORAH SHOW THIS WEEK. We had Amanda Lazmon a Belgium based Nigerian Gospel singer with a Courageous and Inspiring life story. Then Sean Contractor Jamaican Reggae Artist / Marketer all the way from Jamaica who left us with a message "Education is the key to life". 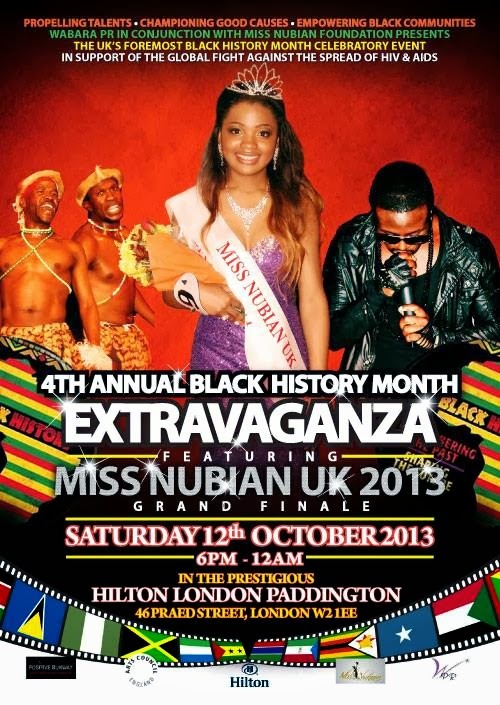 As if that was not enough we had the beautiful young ladies contesting for Miss Nubian UK 2013 beauty pageant, who showed us there talents, not to be missed. To comfort them we had the winners of Mister Africa International 2013 who showed us there Six packs and later Sporah gave them a task to judge the girls on the challenges that Sporah assigned them to do. Lastly but not least we had Marva William from Vanessa blake cosmetics UK who taught the girls how to make their own LIP GLOSS very interesting do not miss this. Sporah: Contractor! Nice name, Welcome to the show. Well, I love what i do and Contractor is fantastic name to that what i do... Hahaaaa! Such a lovely and funny guy we talked and talked and talked about his Music, his business and his life in general. What an inspirational man he insisted on the importance of Education on every single statement he made. Love it.! Thank you so much Mr Contractor it was nice having you on the show. Amanda Welcome to the Showwwww! Thank you Sporah, am glad to be here. I am 43 year old Belgium based Nigerian woman. I am married and have two beautiful girls. I wanted to be on the show because I feel that I have something to tell the world through my music and my life and the message is never give up no matter the situation God is in control. I got married 16 years ago and had a very long battle with bareness. I spent a lot of money on treatment, lost a set of twins at 5 month pregnancy, doctors certified from the university of Leuven that I had a half womb and would never have children, everybody gave up on me but God never gave up. Today I am a mother of two. Coming to my health, if you look at my video you will notice that one side of my face does not function well(facial palsy) I am recovering from a major operation( I am still in pain and was in pain during the production of this album) people tried to discourage me from doing the video but I did not give up because I want the world to know that you can achieve your dreams no matter the obstacles or your age. What can i say!!!!!? PRAISE THE LORD! I have nothing to be ashamed of, a lot of people allow circumstances in their lives to stop them from their goals. Sporah i want to speak to all those who see themselves different from others, that their scars or flaws should not stop their dreams I believe that someone somewhere will look at me and say" if she can come out with her scars, so can I"
Ohhh! My GOD, Amanda thank you so much for such courage's and inspirational words. What a wonderful and strong woman. Safe journey on your flight back to Belgium Amanda. AMANDA ROCKING THE STAGE LIVE PERFORMANCE ON THE SHOW ..
EVERY ONE GOT MOVED WITH HER PERFORMANCE AND JOINED HER ON STAGE AND DANCED AWAY...!!! And this is how it ended! Guess what happened here ? Guys welcome to the show! Tell me about yourselves? Jaydon Anderson (Winner Mr Africa International 2013) from Botswana. OKAY! Guys tell me about the competition? Mister Africa International is Africa’s most anticipated male pageant and it is the search for the most enterprising and desirable man in Africa. It was founded by Ayotunde Fabamwo , the CEO of Twitch & Stiles Events and produced by Jennifer Richards of Just Fashion UK. The world’s most sporty , business minded and handsome African men come together in a pageant setting to compete for the ultimate title. They had to do some tasks assigned by Sporah they had to eat a piece of Lemon in 30sec then the first three winners will have a chance to do another challenge to win a goody bag from vanessa Blake Cosmetics UK. Marva from Vanessa Blake Cosmetics walks on stage to shows the girls how to make lip gloss which is part of their next task. OKAY! Marva lets get started, hope you'r ready girls? Done now its your turn girls, the three winners from the first task. Now it is time for competition Miss Nubian Queen .. where they are going to make some customized lip-gloss for them selves from a leading product brand here in UK Vanessa Blake. MEET THE JUDGES...... FOR THE DAY. Our Winner got her present from Vanessa Blake Cosmetics UK . Thank you so much guys for making this day a success. And its a WRAP for now!